This past weekend the Bates Men’s Team travelled to Williams College to compete with 15 other schools in the USTA/ITA New England Championships. The top 56 players between these schools were entered into a singles tournament, and the top 32 pairings were permitted into the doubles tournament. Andy Peters was the #1 seed and expected to win the singles tournament after coming off a team national championship and finishing last season ranked 6th in the nation. For doubles Nick White and Simon Miller of Brandeis were the top seeds after their strong performances last season. In Berg’s second round match, he faced #8 seed Nick White from Brandeis. Berg carried the momentum from the first win beating the senior 6-0 6-1. The win sent Berg on to day 2. Sophomore Rob Crampton received the #9 seed after his strong play at the Middlebury Invite earlier this fall. Although he received a seed, Crampton’s first round match was anything but easy. He was matched up against Alec Parower from Middlebury, a big server and intelligent player. Crampton came out hot. On serve at 1-2 in the first set, Crampton won 9 straight games hitting heavy balls and attacking the net to take a 6-2 4-0 lead. At this point Parower changed his plan and Cramptons high play dropped slightly allowing Parower to fight his way back into the match. At 6-6 in the second set, Crampton had to play a tie-breaker, his third of the year. Just as he had done in his other two tie-breakers, Crampton elevated his focus, and gutted out the victory winning the tie-breaker 7-4 for a 6-2 7-6(4) victory. In his second round, Crampton faced Curtis Wu from MIT. Wu was an athletic left-handed player with lots of racket skill. Once again Crampton came out hot and gave himself a 6-1 5-2 lead. Wu then played his best two games of the match before Crampton served out the set for the 6-1 6-4 victory and moved on to day 2. Sophomore Matt Bettles received the #6 seed and with it, a first round bye. In the second round, he faced Teddy Rozenshteyn from Brandeis. Bettles had beaten Rozenshteyn weeks earlier at the Middlebury Invite and this was no different as Bettles handed Rozenshteyn 6-2 6-2 loss to advance to day 2. In doubles, Matt Bettles and Timmy Berg received the #5 seed. 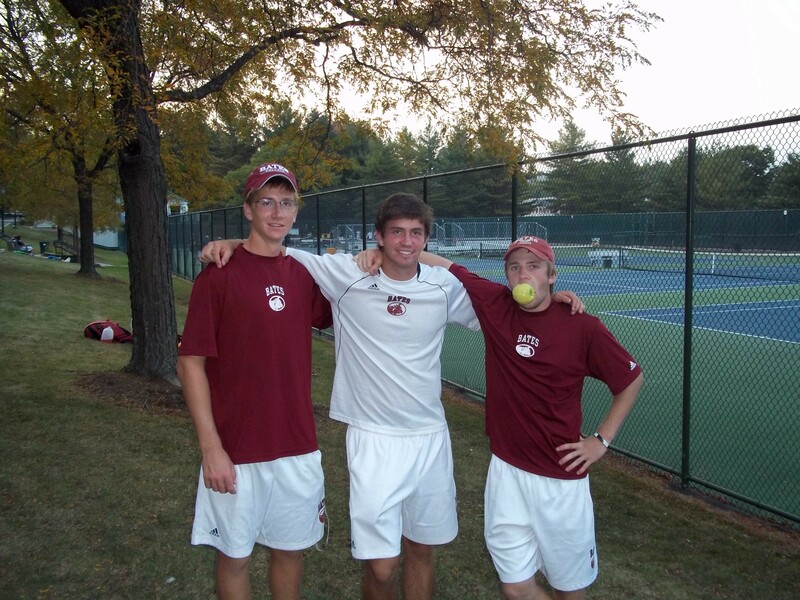 Their first match was against Paul Kohnstamm and Pat Monaghan from Tufts. The Tufts players were tall with large serves but Bates would not be denied. Dipping returns and playing tenacious defense, Bettles and Berg got the win 8-3. In the second round, they faced an athletic Clark pairing, Diego Angel and Harris Rollinger. Once again the Bates pair rose to the occasion and broke late in the set to seal the win 8-5 and advance to day 2. The day kicked off with singles. In his round of 16 match, Timmy was up against Chris Schlabach, the Middlebury player who had defeated him weeks earlier. Timmy got his vengeance as he gutted out a 6-4 6-4 victory to advance to quarterfinals where #1 seed Andy Peters awaited. In the first set Peters was on fire. With his big serve he rifled aces and refused to miss from the baseline quickly taking the first set 6-2. In the second set Berg got his legs under him and gave Peters all he could handle. The set was a battle of Berg’s aggressive baseline play versus Peters speed and defense. After a little more than an hour into the set, they were deadlocked at 6-6 and would play a tie-breaker for the set. Both players brought all they could muster, each having chances to take the set. Peters eventually took the breaker 10-8 and the match for a 6-2 7-6 (8) win. It was a great match for Berg as he fought off 8 match points before Peters finally won the 9th and everyone in attendance was impressed with how the first year conducted himself through the pressures of such a big tournament. In Rob’s round of 16 match he face Luis Rattenhuber of Amherst, the #5 seed and German transfer from D1 school San Diego State. Standing at 6’6” Rattenhuber had a big serve and aggressively attacked the net. However, The first set was all Crampton. Yet again he came out firing and quickly took the set 6-2. In the second set Rob built up a 5-2 lead and had a chance to serve out the match. Unfortunately, Rattenhuber would not go down without a fight. Sticking volleys and making ridiculous gets, he broke Crampton twice and forced a second set tie-breaker. Going into it, Crampton was 3-0 in tie-breakers on the year. He played a great breaker by ripping passing shots and playing the aggressive style that had earned him the lead. But Rattenhuber played slightly better and was able to fight off two match points to take the breaker 8-6. As the third set started Rattenhuber continued to play better and better and was took the set 6-2 for the win. It was a solid performance by Crampton and this close loss will only motivate him for upcoming season. Matt Bettles round of 16 match was against #9 seed Bryan Chow of Williams. Chow is a speedy player who likes to play aggressively from the baseline. Unfortunately for Chow, Bettles was on top of his game. Matt quickly took the Williams player out of his element for the 6-1 6-3 victory. In the quarterfinals, Matt matched up against #3 seed Mark Kahan of Amherst. Mark finished last year ranked #12 in the nation. He is an all-court player and tough competitor. Everyone knew this match was going to be incredibly difficult. In the first set, Bettles enforced his will, hitting high, heavy balls and attacking the net to take the set 6-3. In the second set Kahan fought his way back into the match taking advantage of some untimely Bettles errors to win the set 6-4. Bettles was quickly able to mentally let go of the second set and re-focus for the third. Matt took the set 6-2 and earned himself a place in the semi-finals against #1 seed Andy Peters. Exhausted from two tough singles matches, Berg and Bettles matched up against #3 seeds Rattenhuber and Kahan from Amherst. Though Bettles beat Kahan earlier in singles, it was Kahan who prevailed in this match up. All four players on the court were completely spent from long singles matches and Rattenhuber’s serve was the x-factor in this match. Amherst took the match 8-2 and eliminated Bates from doubles contention. In the best match of the tournament, #6 seed Matt Bettles took on national champion, #6 in the nation, and #1 seed Andy Peters in the semi-final match. The game plan for Matt was to isolate Peters on one side of court with high heavy deep balls and then attack the open court off of short balls from Peters. Bettles had a tough time enforcing the game plan early and Peters started strong to take a 5-2 lead in the first set…. Then something changed. As though a flip was switched, a new Matt Bettles came out. He refused to miss. He attacked the net ruthlessly, pounding volleys for winners and then also hitting some perfect, touch dropshots. Bettles won 5 straight games and the set 7-5. The second set was a battle of breaks. Neither player could hold serve which increased the drama for the fans and also gave Coach Gastonguay an ulcer or two. An hour into the set they were deadlocked at 6-6. Peters, with so much experience and poise was the favorite in the situation. He bombed an unreturnable serve for the first point then attacked Bettles serve and came in to hit an easy volley for a 2-0 lead. Then the Bettles from 2-5 down in the first set came back. He rose to the occasion refusing to miss. Hitting topspin lob winners, passing Peters on both sides and then finishing points at the net, Bettles won 7 straight points to win the match 7-5 7-6 (2) for the biggest win thus far in his Bates career. In the finals Bettles met up with #4 seed Felix Sun from Williams who was fresh coming off a win over #2 seed Stephen Sullivan from Bowdoin 6-4 6-2. Sun is a road runner. With a similar style to former pro Michael Chang, he has impressive speed and hits better on the run. He is a counter puncher but also has the ability to finish points off at the net given the opportunity. From the beginning, Matt didn’t have the same energy he had against Peters. Beating Sun requires fresh legs, patience, and the ability to work for long gruelling points. As he had done all tournament, Sun played solid tennis. He missed very few shots and took advantage of the opportunities he was given. Sun won the match 6-2 6-3 and will represent the region in the Small College National Championships in Mobile, Alabama October 14-17. It was an amazing tournament for Matt and being only a sophomore, we have no doubt he will get his way to nationals soon. Overall, the Bates Men did themselves proud. 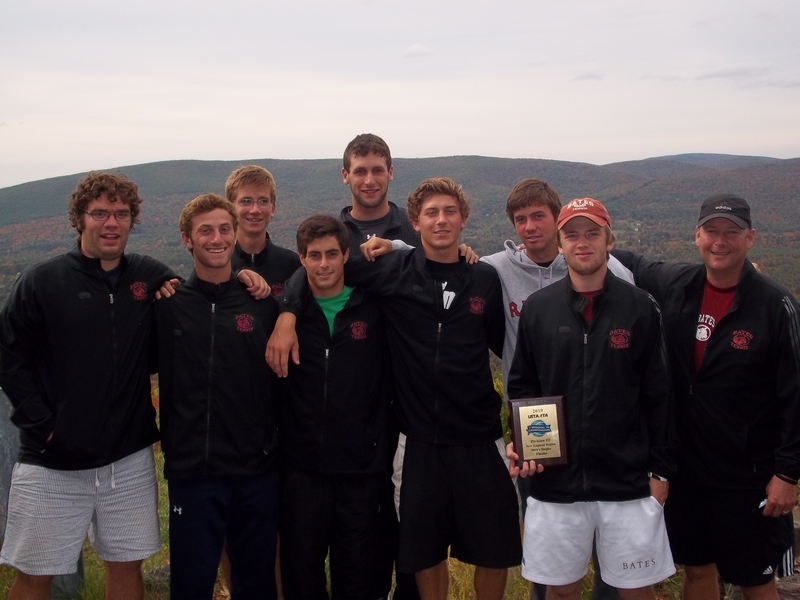 Playing in the hardest ITA in the nation with teams ranked #’s 1,2,11,14,15, the Bates men showed that they belong in the top-tier of teams having just as many members in the top 8 as #1,2,and 11 schools. This gives the men something to build on as they practice for the Wallach Invitational on October 9-10. 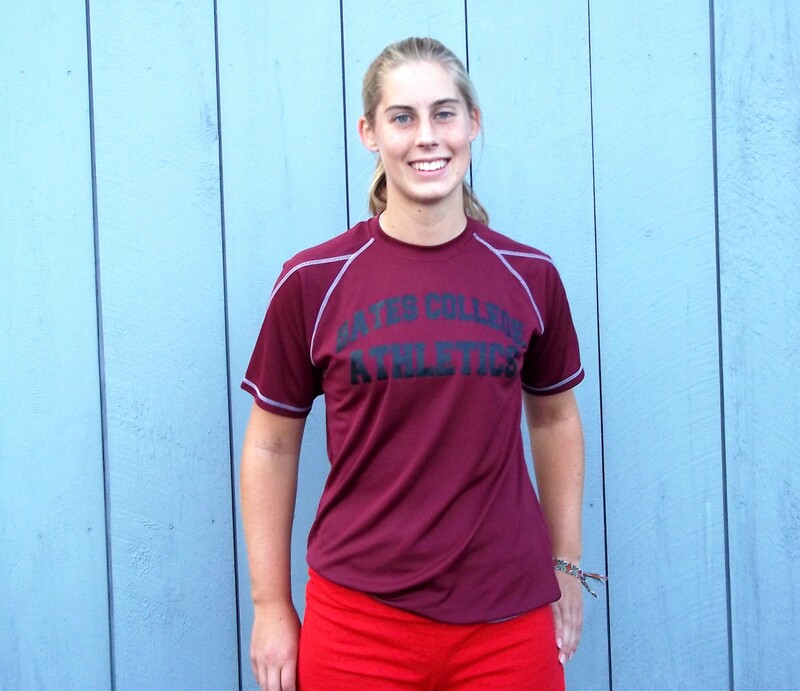 Next up on Meet the Bobcats is first year Kristen Doerer. 1. Where are you from and what high school did you attend? I am from Madison, Connecticut and I went to Daniel Hand High School. 2. Who is your favorite tennis player? 3. What is the best book you read in the past year? 4. Why did you choose Bates? 5. What do you plan to major in? 6. Robert Pattinson or Taylor Lautner? 8. What are you most looking forward to about college? 9. What was the last movie you saw? The Bobcats kicked off the season at the Middlebury Invite this past weekend. Doubles was played first and was a good chance for the first-years to get their feet wet. In Flight B doubles, first-years Ben Bogard and Eric Ruta jumped a strong team from Skidmore 8-4 before losing to a team from Middlebury. Senior Sam Woods paired up with first-year Peter Yanofsky to win their first match 8-5 against Trinity before falling to a Middlebury pair. In Flight A doubles, Timmy Berg and Matt Bettles got off to a rough start in their first match, but fought back in their second match to beat Brandeis. In Flight A, Matt Bettles rolled through opponents to reach the semifinals (including a top Middlebury player). In the semis he played a good match but fell to eventual champion Andy Peters. 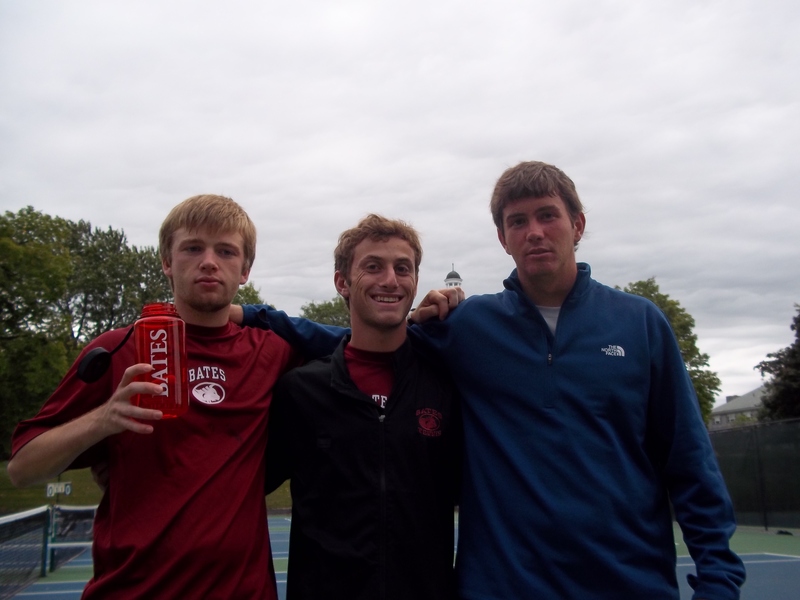 Rob Crampton was the other Bobcat representing Bates in the A Flight, and he showed everyone the grittiness that defines Bates tennis players. In the first round Rob faced Derrick Angle from Middlebury. After dropping the first set, He battled to win the second set and then out toughed his opponent to win a super tie-breaker for the third set. In his second round, Rob faced Nick White from Brandeis, the #2 seed in the draw. Rob got off to a slow start and found himself down a quick set 6-2. He then upped his play and pulled off the upset again winning the third set in a clutch super-tiebreaker. In the semifinals Rob faced Rich Bonfiglio from Trinity. Unfortunately, Rob sustained an injury to his serving arm and had to retire early in the first set. Other results for the Bobcats included Timmy Berg, Eric Ruta, and Dylan Reffe who all finished 1-1 at their respective flights. Overall it was a strong showing for the Bobcats and the team will be working hard to prepare for the ITA tournament in the coming weeks. Next up on Meet the Bobcats is first year Timmy Berg. I am from Sarasota, Florida and I went to Cardinal Mooney Catholic High School. 2. What is you favorite movie? I liked the team, the academics, and the school in general. I have to think about this, but probably surgeon. 7. If you could go anywhere in the world where would you go? 8. Favorite sports team and pro athlete? Christmas, that’s when I have the largest family gathering and also the longest break from classes. Greg Janssen enters his first year as the men’s and women’s assistant coach for Bates tennis in the 2010-11 academic year. Janssen graduated from Coe College in 2010 with a degree in business administration. 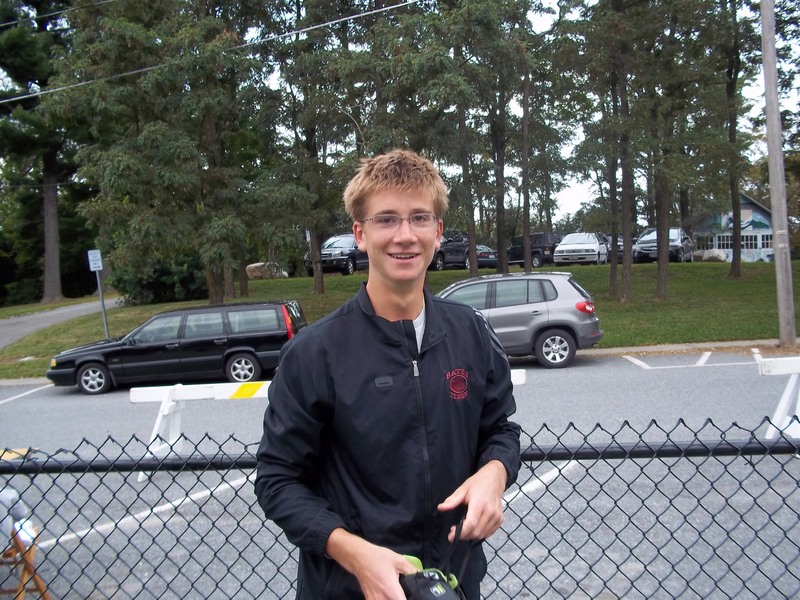 While at Coe he was captain of the men’s tennis team in 2009 and 2010. He was also voted to the All-Iowa Intercollegiate Athletic Conference First Team three times in both singles and doubles. In 2010 he was voted IIAC Men’s Tennis Most Valuable Player. During his four years at Coe he totaled 157 singles and doubles wins combined for sixth most in school history. Janssen inherits young, but talented teams and is very excited for the upcoming season.